Freedom Riders heading into Cal Expo for the rally. Sacramento Harley Davidson spokes person said it was the biggest turnout for a first time event he'd ever seen. It is estimated there were around 262 motorcyclists and passengers signed up for the ride. Sue relates, "It was Patty Meckler's idea to have a Freedom Ride after she met so many Vietnam Veterans whom she kept learning were 'biker's.' It would be a way for patriots to honor Veterans. The ride started with kickstands up at 8:30 a.m. from Renegade in Grass Valley. The owners are avid patriots and were so awesome. I got a late start due to last minute registrants, but one nice biker said, 'Don't feel rushed, I'll wait for you.' It was so exciting to watch everyone ride off and hear the Harley hum. There's nothing like it. I would estimate at least 75 bikes left from Grass Valley. Eventually we caught them before arriving at the next rally point, TDS Guns in Rocklin. There we met with more people registering. Leaving there I ended up riding next to a bike that was totally painted a flat gray green. The tailpipes looked like gatlin guns and the gas tank had bullets mounted on it. It was awesome looking with a really good looking driver to boot. I met him at our next stop, Sacramento Harley Davidson. There we picked up more Freedom Riders and the Meckler's yelled, 'Sue, can you help us sell some Tea Party Patriot flags? We want them on all the bikes.' So, I did better at visiting and meeting nice people than selling, but once Mark Meckler spoke and people realized he was there, I told him, 'You being here sold the flags!' The Harley hum was awesome and lengthy leaving Sac Harley toward Cal Expo. Looking in my rearview mirror and seeing so many headlights behind and forward, I got choked up ... Veterans and true patriots honoring, standing up, for our country and saying, we're taking it back. Not unlike our founding fathers. Our lives, our fortunes, and our sacred honor. I want to be on the right side of history. I am a patriot and nothing is more important than God and country. There's a new song called, 'I Refuse' that has become my motto. Some of the words are, 'Sometimes I just want to close my eyes and act like everyone's alright, when I know they're not ... I could just say a prayer and act like nothing's wrong ... but ... I refuse to sit around and wait for someone else to do what God has called me to do myself ... I could choose not to move, but I refuse ... It's time for me to follow through ... I refuse to make one more excuse. Cuz I don't want to live like I don't care." Sue continues, "As all the bikers were waiting 2 X 2 it was fun. Every stop you never knew who you would be next to. We all got to know each other as we took off our helmets and were told, 'You're on private property, you aren't required to wear them.' Cheers and discussions went up about over regulation. Not that there's anything wrong with wearing a helmet for safety, just having your government command you to do so with another law. Cheryl (below) then wandered by on foot in her Marine Corps uniform trying to get to the front where they would be lining up for the missing man formation. That was a proud moment for little sis Sue, seeing Cheryl again in uniform, and that she got such an important role in the rally. Just before the entrance to the rally we went under a bridge and each Harley driver revved their engine ... Wow, I just laughed and got a total kick out of that patented Harley sound. I later learned that's standard for bridges. In fact years ago I recall enjoying that in my Z28 with it's V8." A Missing Man formation is an aerial maneuver intended to honor the missing members of the military. It has been adopted by all patriotic groups such as you see here today with our Freedom Riders To Honor all of the Military Men and Women who have made the ultimate sacrifice for Freedom and Love Of Our Country. Rich Dyer (Purple Heart and Bronze Star recipient and Viet Nam Veteran) on the lead bike with TPP co-founder Mark Meckler as his passenger. Stan Hill (Army MP with two Marine sons currently serving in the Military and Owner of Thunder Roads Northern CA) on the second bike with our Nor Cal Tea Party Patriots Organizer and Board member Ginny Rapini as his Passenger. Mike Perry (Veteran Marine, current Correctional Officer at Folsom State Prison, served as Patriot Guard and Leads Roughnecks Police and Fire Biker Organization) On the Honor Guard Bike next to the Missing Man with Cheryl Heward (Veteran Marine in Uniform as his Passenger). Bill Bryant (American Legion, Patriot Biker) and Shaun Blue (Sons of Liberty, Patriot Biker) Serving as the Rear Guards. Let’s show our Appreciation for these Courageous Men and Women and cheer them on. Opening the event is co-founder of the Tea Party Patriots Mark Meckler. The Tea Party movement began in February of 2009 when a television reporter at the Chicago Stock Exchange said, "It's time for another Boston Tea Party." Immediately after that comment, the internet exploded with people from all parts of the country, all walks of life and both sides of the aisle shouting a resounding "Yes!" in agreement. Little did that reporter know that what he said would spark a flame that is burning brighter every day since. Sue, Ted Gilbert and his friend. Neal Robinson, (another rider), and Tom Spreier. The Bagpiper playing "Amazing Grace." Mark with his children Jacob and Lucy. Behind him (left) is Brad Dacus of Pacific Justice Institute. Sue describes "Heading to the rally with the national anthem being sung and having a little bit of insider information, I looked to the sky and located a dot. As the parachuter got closer towing a huge American flag behind him the crowd really woke up. It was awesome!" Cheryl, National Anthem singer Lisa Ellis, and a Korean Veteran. The Meckler's, Smiths and Cheryl. Mike Perry's Vietnam Memorial Wall Harley. Cheryl says the side saddle ride was comfortable. Sue, Cheryl, Patty, and Lisa as Mike prepares to leave. Speaker Caleb Yee is the leader of the first High School TPP organization. Cheryl, Caleb and Sue sharing a photo. Ginny Rapini NorCal Tea Party Patriots organizer and Board member. Kim Pruitt with Mark Meckler. Mark and Congressman Tom McClintock. Jon Coupal of the Howard Jarvis Tax Payers Association. Hugh Hewitt's a radio talk show host. In the background (left of center) is the tall white replica of Washington Monument with fifty flags around it. Jon and Tom talking it over. Behind them is Rex Ruth who played Samuel Adams in the Re-actments. He authored the book "Blood, Fire & Faith, how freedom became a country." Sue and Nancy Garcia visiting the portable museum replica of Philadelphia Independence Hall (below). Nancy is Vice-President and Board Member of the Nevada County Tea Party Patriots. 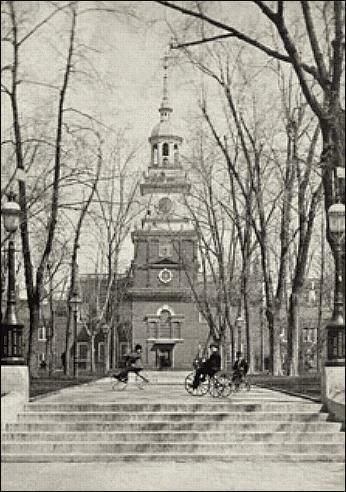 Independence Hall was used for the Constitutional Convention During the hot summer of 1787. The windows were boarded shut so that the others could not hear the discussions going on inside. James Madison was principally responsible for the convention and was the most prepared member present. It was his plan, the Virginia plan, that was introduced, debated, and became the foundation upon which the Constitution was built. After four months of heated debate, the Constitution was unanimously adopted by the convention and signed on September 17th, 1787. Sunburn Sue's return after a great afternoon with the Patriots. Sue concludes, "I feel so blessed to be acquainted and friends with the Mecklers, who are obviously authentic people and inspired patriots. To be able to work with them is such an honor as well as with Ginny Rapini and all those who are laying it on the line for their country. We all keep each other pumped and this is a lifetime commitment. It's up to us, if it's up to anyone." The NorCal Tea Party Patriots are committed to our nation's Constitution. They'll work to remove from office, those who undermine the Constitutional guarantees. The laws handed down by our Forefathers and those who have given all to ensure our freedom. God Bless you and America.